The African wild dog, lycaon pictus, is one of the rarer creatures in nature, not only are they severely endangered, but their intelligence, social pack structure and attractive appearance make them one of the more memorable species on Africa’s list of predators. More than 500 000 wild dogs once roamed across 39 countries in Africa, but today, only 5000 are left in just 25 countries, and Namibia can proudly say that it is one of these last bastions of wild dog society. Although wild dog are occasionally encountered in Khaudum and the Caprivi strip, the best way to see them is to take the short trip from your Windhoek accommodation to view them at the N/a’an ku sê Foundation, or at Africat in the Okonjima private game reserve, about 2 ½ hours from Windhoek. Here you will learn more about the fascinating social structure of these predators. Wild dogs live in packs of up to 40 members, led by an alpha male and female. This considerable group structure is vital to their hunting methods, which have a success rate of about 80% – extremely effective when compared to the 30% hit rate of the lion. The dogs are highly intelligent and excellent communicators; keeping in touch by means of clicks, grunts and howls. While they hunt in silence, usually every day at dawn, each effort seems to be coordinated beforehand with a greeting ceremony consisting of licks, sniffs and twitters. The pack operates in rotation, systematically running down their victim, typically impala, once it has been isolated from the herd. The wild dogs bring their prey down by ripping pieces off it as the hunt progresses, until the animal eventually collapses from exhaustion and blood loss. This seemingly brutal method is largely dictated by the small size of the dogs, who reach a shoulder height of just 70cm and weigh only 25kgs. 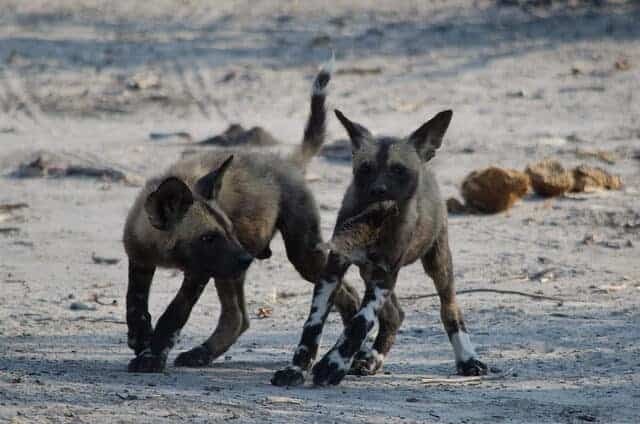 Although competition for food with larger predators has played a role in the decimation of wild dog populations, it is their reliance on a very large range which is mainly to blame. Very few game reserves have sufficient space to accommodate their space requirements, of about 250km2 per pack, and without many safe havens, they find themselves in constant conflict with mankind, and vulnerable to poachers. Don’t miss out on the opportunity to visit these wild dog sanctuaries while staying in Windhoek, by doing so, you are directly contributing to their continued existence.